Ivan Klobučarić was one of the most important Croatian cartographers at the turn of the 17th century. In 1579 he produced a panorama of Rijeka which is kept in the War Archives (Kriegsarchiv) in Vienna. The Styrian Provincial Archives (Steiermärkische Landesarchiv) in Graz houses a map of the Bay of Rijeka with a panorama of the city dated 1586, attributed to Klobučarić. His cartographic legacy created between 1601 and 1605 can be found in the Clobucciarich – Skizzen collection. It comprises 108 sheets. Most are double-sided. 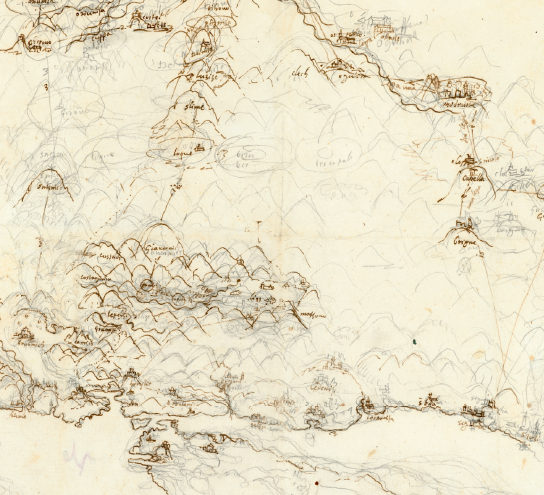 Some pages show two or more items, so that the entire collection includes around 500 cartographic depictions. In terms of western Croatia, there are about twenty. This paper provides a list of the contents of Klobučarić’s cartographic depictions relating to the area of Croatia. A sketch of the Kvarner Littoral from Rijeka to Sveti Juraj with the mainland hinterland is described, with a map of parts of Croatia from Rijeka to Omiš with the mainland hinterland. An analysis was conducted of the contents of the parts of the sketch and map showing the Kvarner Littoral, comparing the representation of settlements showed and those omitted, with toponyms on the map and those shown on earlier maps of the Kvarner Littoral. The paper indicates errors in previous works about Klobučarić’s life, work and cartographic activities.